After you click Subscribe, the playlist appears at the bottom of your left sidebar, along with all the other playlists you’ve either subscribed to or added. Whenever you click a Facebook contact, his public profile, which includes his published playlists, opens. Scroll up and down the list to browse his public playlists. The first ten tracks of a playlist are displayed, which gives you a good idea of the music you can expect to hear in that playlist. To see the full list, either click the playlist title or the See All x Tracks link, where x is the number of tracks in that playlist (the playlist could have a few dozen tracks, or it could be a mammoth 1,000-song countdown), at the bottom of the first ten tracks. After you open a playlist, you can filter it by pressing Ctrl+F (Command+F on a Mac) and, in the Filter bar that appears on the top of the main pane, type the name of what you want to narrow your view down to (enter an artist’s name to show only songs by that artist, say). Next to the playlist name is a number listing how many other people have subscribed to that playlist. 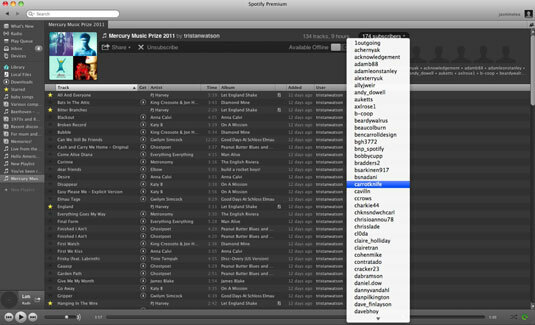 You can click this number to open a drop-down list that displays all the usernames who’ve subscribed to a playlist. Just select any name to see that person’s profile. The personalization features on the Internet (which make very specific recommendations based on your web-browsing history, music tastes, past purchases, or even the text written in your e-mails) can sometimes seem like they’re pigeon-holing you, depriving you of a world you don’t know but might like to experience. Thanks to Spotify, you can get a bit random in your music discoveries by seeing who’s subscribed to a playlist that you also like. You have at least a slight music compatibility with those users because they obviously like the same music that’s on that particular playlist — but chances are there’s not so much overlap in music interests that you’re both boringly similar. Next to a playlist, you see Subscribers with the number of people subscribed to it. (If only the creator of the playlist has subscribed to it, you don’t see any number.) Click this link, and a drop-down list appears, showing the usernames of the people who have subscribed. You can click any name in this list to see that user’s public profile and what music she’s also into, sparking the beginning of a musical chain reaction. Nifty, isn’t it?